The siren-loud noise of indie pop at 5 in the morning on a Saturday was not what I wanted at 5 in the morning on Saturday. My 15-year-old son tends to sleep through his alarm, which is why he continues to raise the volume from time to time. But why the alarm on a Saturday? My son asks Alexa to turn his bedroom lights on and off, do math calculations, define words, find addresses, play music and, evidently, do whatever she wants with the alarm. 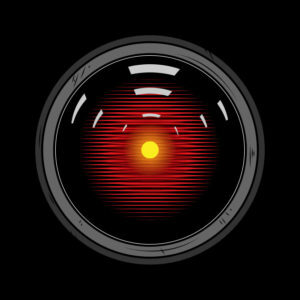 Didn’t “2001” prove to audiences that the HAL 9000 was a bad idea? Didn’t it try to kill the humans? Even the machines in the “Terminator” movies plotted to take us over. So why is artificial intelligence such a good idea? My son says he just thinks it’s cool. Yeah, until it comes after you in a big rig with an arsenal of fire power. Nevertheless, the kid’s got his room wired with A.I. He also carries a smartphone, wears a smart watch and even has our TV voice activated. But the thing that made me grab my family and get us out of our “intelligent” house was the experiment my son conducted based on a theory he’d read about on the Internet. My kid had simply powered on his phone and repeated “cat food” aloud several times. Hours later, cat food ads were popping up in his social media feeds. Our tech listens! My wife told the kid (like I wasn’t there) that he’d win anyway. As I laced up my shoes for our “noncompetitive” run, I told my son to turn off the lights in the house. Outside, we took off running, the kid and I side by side. Neither one of us ran hard. It couldn’t appear like we were trying to beat the other. But we gradually picked up speed, leaving Mom behind. My son’s AirPods distracted us. It wasn’t long before my kid started panting and I began pulling away. He claimed it was due to the fact that he had to take more steps than I did. I had a longer stride, he said, and he tried to prove it using the “Steps” app on our phones to compare steps. “There should be an app that yells at you to lay off the tech,” I said. Of course we opened the “Find Friends” app to find her. No service. Or maybe she’d lost service. Or she fell, hit the ground, destroyed her phone and was lying in the street unconscious and losing excessive amounts of blood, with her loving family nowhere near to save her because we were too distracted with tech! Or she was at home on the couch, safe and sound, watching an episode of “Married at First Sight” on TV. Yup, that’s where we found her. Technology got the best of us again. I had to put my foot down. There could be no more tech overload. But first I wanted to see that cool banking app with roast mode. My son pulled up some videos, which began right after the cat food ads. This story appeared in The Acorn Newspapers of Los Angeles and Ventura counties, CA,in March of 2019. You can find other stories like it from Michael Picarella in his book, “Everything Ever After (Confessions of a Family Man),” and at MichaelPicarellaColumn.com.